Today, we have Kim from Cravings of a Lunatic. We had the chance to meet at Food Blog Forum a few years ago and have kept in touch ever since! I participated in Kim’s cancer awareness recipes from the heart, food blog hop last summer sharing my recipe for spicy beef sliders. 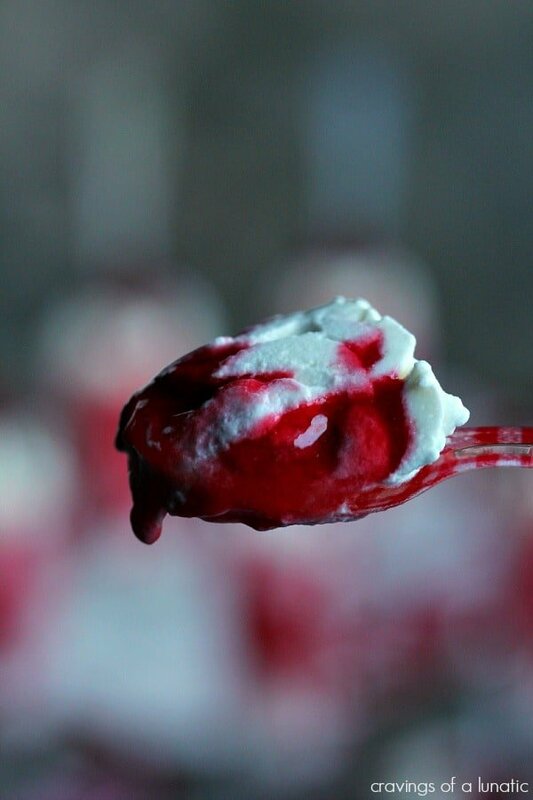 Today, Kim shares with us her no-bake recipe for Raspberry Fool. Hello there Katie’s Cucina readers. I’m pleased as punch to be here today. When Katie asked for guest posters for her maternity leave I was honoured to be included. I adore this gal. There’s just some folks you meet trough blogging that you instantly love. Katie is one of those people. Kind, caring and so incredibly talented. Since you’re here my guess is you know all that. You know Katie is awesome. She’s also a great planner. I think it’s a cool thing that she invited her friends to guest post while she spends some much-needed time being a mommy. Honestly there is no greater gift in the world than becoming a parent. I know Katie is going to be the most amazing Mom, and I look forward to following along as pregnancy photos make way for baby photos. So excited for Katie and Jon, this will be their best adventure yet. I dreamed up a ton of recipe ideas for the post. Obsessive compulsive is my middle name, I tend to get really stressed out for guest posts. I never know whether to be serious so I don’t freak out someone else’s readers, or whether I should just be myself, which involves being a bit of a spaz. Hopefully I find some middle ground today. When I can’t sleep I tend to spend huge amounts of time on pinterest. I love Pinterest, more than life itself most days. I enjoy using it for work and personally as well. It’s my down time at the end of the day. So one night I was cruising Pinterest, pinning everything from cute men, to DIY project ideas, to recipes. 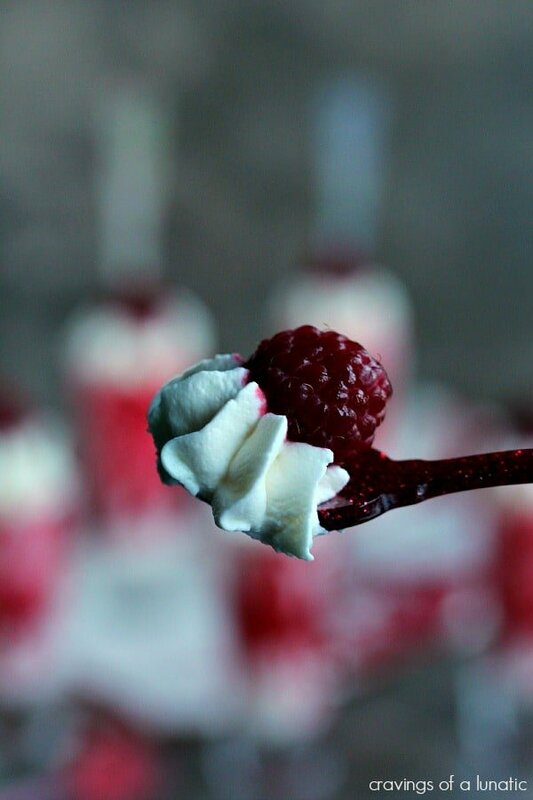 I happened upon this Raspberry Fool recipe from Martha Stewart. It was not the recipe itself that drew me in, it was the presentation. Her Tangy Raspberry Fool photo that was stunning. I knew I wanted to try the technique to swirl the raspberry mixture. Fool is something we make quite often. It’s easy and my daughter loves it. She hates cream cheese so when I make no bake cheesecake recipes for my site I tend to make a couple without cream cheese. That way Mini-me is happy and gets her fool, but we still get to have lots of no bake cheesecakes. It’s a total win-win. Fool is super easy to make, the recipes are all very similar. Essentially it’s cream, confectioners’ sugar and fruit. You can mix up the fruit, you can add nuts or granola to it. For me I like it as plain as possible. Let the fruit stand out as the star. Combine the raspberries, sugar and salt in a blender, or food processor with the chopping blade. Turn on pulse or puree for about 1 to 2 minutes. You want the sugar to dissolve and the raspberries to become as smooth as possible. Now pour the raspberry mixture through a fine sieve, and discard any seeds caught in it. It helps to use the back of a spoon to press the berries into the sieve. It will make the process faster. In a stand mixer (or large bowl and hand mixer) whip the heavy cream and the confectioners' sugar. Start slow until it thickens slightly, then amp the speed up to high. Whisk on high until stiff peaks form, which will take about 3 to 4 minutes. 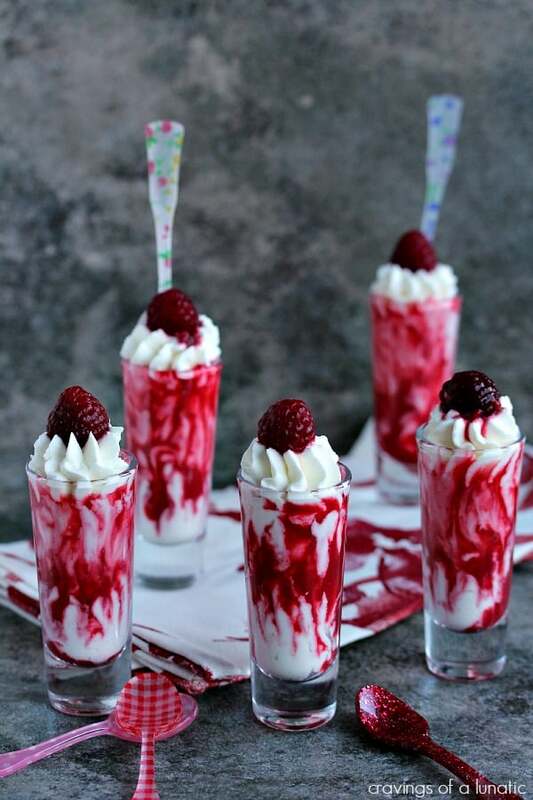 Take decorative glasses and alternate adding the whipping cream mixture and the raspberry mixture. Once you fill the glasses take a knife or wooden skewer and swirl and pull so the mixture starts to show patterns. I found pushing the skewer down in a rapid movement worked really well for the fun lines down the sides. 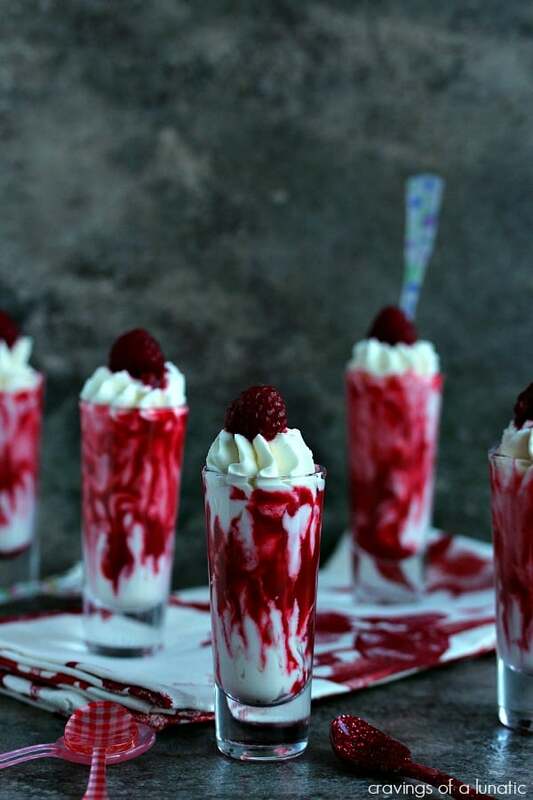 Top with extra whipping cream and raspberries for garnish if desired. You can serve these immediately or pop them in the fridge for about an hour. If you're going for the dramatic look serve them as close to making them as possible. The longer they sit in the fridge the more the color becomes muted and not as striking. Serve with a big old raspberry smile! I hope you like these. I’m a total fool fanatic. I make it every chance I get. Feel free to experiment and play with flavours. Use what you love and you can never go wrong. Thanks so much to Katie for having me today. It was a total pleasure spending the day in the Cucina. Feel free to stop by my blogs to check them out. I blog at Cravings of a Lunatic, and also Kiss My Smoke. I’m a pinterest spaz and have also recently become obsessed with instagram. I have no idea what I’m doing but with 2 kids, 3 cats, a puppy and a horse I never run out of photo material. Occasionally I even toss some food photos up just to keep things interesting. I love a fool! Although too many would say that’s appropriate. 😉 Anyway, such a nice easy dessert that delivers loads of flavor. Terrific guest post — thanks so much. You guys! Seriously! This looks amazing!!! Pinned! Thanks Anna–Kim did an amazing job on this recipe–love the simplicity! Can you make this with any other fruit, like strawberries?!? Holy smokes. There is something so decadent about raspberries already, but this? My word. I agree Karen, I can’t wait to try this recipe!!! Awe thanks Karen. I love when people love the recipes. This was fun to photograph. Agree Karen! Perfect dessert for easy entertaining! Kim, I love how insanely fancy and elegant these look but they’re also so simple and easy to make! Hmm…maybe I shouldn’t speak so soon. The ingredient list may be short but I doubt I’d make mine as beautiful as yours. This is a lovely guest post (don’t ever be scared to be your fabulous self. People need to deal with you keepin’ it real, y’know?) And thanks for introducing me to Katie’s beautiful space! Presentation is always being touted. It’s like a beautifully wrapped gift, which is as pleasurable and sometimes even more pleasurable than the gift itself. This simple delicious dessert certainly points up the power of presentation. Gorgeous color, beautiful little glasses and just flat out elegantly cute. You just gave me a great idea for a new pudding shot based on your recipe above!! 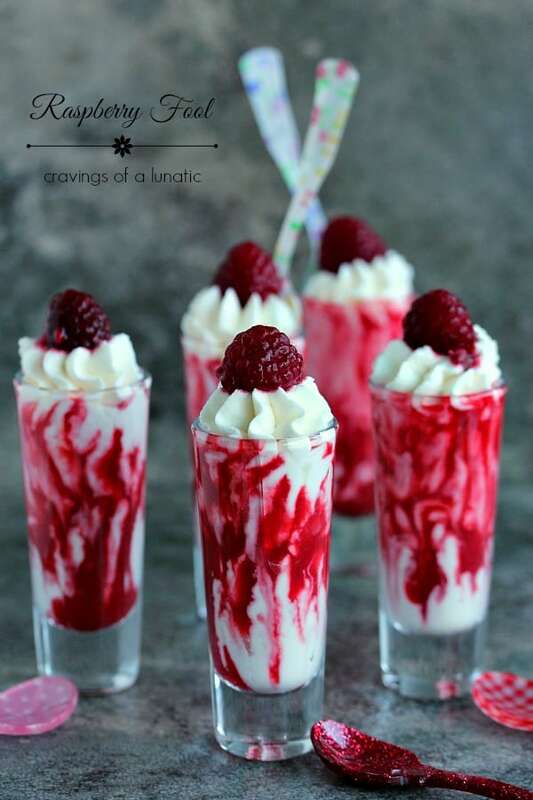 I love raspberries so I will use the raspberry recipe from yours but I will make the pudding part with raspberry liqueur and add it to the whipping cream!!! I’m totally excited!!! I too am addicted to Pinterest – they make it so easy with instant access on your phone and Ipad… in fact I saw this ALL over Pinterest when I was on there yesterday! Love a fool – well anything with cream in it really! Can you tell me where you got those lovely spoons? Hi Carina, this recipe is the best! My friend Kim shared this recipe and she can’t remember where. I would look at a few of the online shops and etsy! Sorry I wish I could help!